We are acknowledged as one of the chief Wholesale Black Pepper Essential Oil exporter in India. 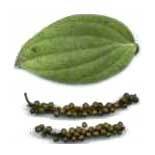 Black Pepper Essential Oil is extracted from the dried unripe berries of Piper Nigrum. The oil is available in colorless to blue-green liquid. It is soluble in alcohols and other essential oils and insoluble in water. Black Pepper Oil is highly valued for Pain relief, Cold, Flu, Cough etc. Besides, we are one of the major Piper Nigrum Oil Suppliers in India.